Get The Perfect Silk Press In 7 Easy Steps! I receive emails all of the time from women asking what products they should use to get an amazing looking silk press (see what a silk press is here) on natural hair that is not greasy or makes the hair look like its stuck to the head. I know that all of you natural women that get a silk press want your hair to look like its flowing in the wind. You want your hair to have lots of body, shine, and most importantly you want it to look healthy right? 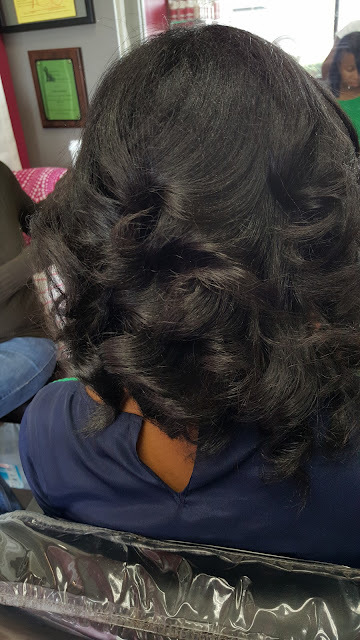 Well today I am going to tell you the top seven best products to use to help you achieve amazing silk press results on natural hair. The name of the company is by L. Jones, which is my company. I know I am a bit partial but honestly if I did not create this company myself I would still be its number one customer. So what makes by L. Jones products different from any other company selling hair products? I would love to answer that question. First by L. Jones products are made by me, a professional hairstylist who does silk presses on a regular basis. As a matter of fact, I do several silk presses per day. Therefore, I know all about what products are needed in order to get the absolute best results. Also, I make the products myself using all top quality products. Many other hair product companies do not have an actual professional hairstylist as the CEO. Some hair companies are made by people who made products that worked for their own hair, but as a hairstylist, I base the results of my products on different hair types instead of just my own. But enough of that, let's get to the good stuff. Today I will be going over the items in the by L. Jones line, which are the items that I use to get the silk press results you see throughout this post. All of the items are sulfate free and paraben free. 1. The first item is the Extreme Clean Clarifying Shampoo. This shampoo thoroughly cleanses the hair without stripping it and removes all of the dirt, oil, and residue from the hair. If your hair is pretty dirty, do this step twice to get that squeaky clean feeling and start the hair with a clean slate. The Extreme Clean Clarifying Shampoo is excellent for oily hair. I also use it on dry hair as well, but instead of shampooing twice, I only shampoo once on dry hair. 2. Item two is the Extreme Moisture Shampoo. This shampoo adds moisture back in the hair. It includes liquid silk to give the hair a soft and silky feel. The Extreme Moisture Shampoo does wonders for dry hair. After shampooing with this you hair will immediately feel softer. When using on dry hair you would shampoo once with this after using the clarifying shampoo. For oily hair also use only for one shampoo after using the clarifying shampoo or, if your hair is extremely oily you can skip the moisture shampoo altogether. 3. Now we will get into the conditioners. The third item is the Replenishing Conditioner. This conditioner continues to add moisture to the hair on top of the moisturizing shampoo. That is the thing about by L Jones products, all of the items in the line build on the other items. After shampooing the hair, lightly towel dry the hair before adding the conditioner. You would use this conditioner by applying a generous amount in the hair (depending on how much hair you have) and comb all the way through the hair from root to tip. Let sit for 5-10 minutes, then rinse with cool water. 4. If your hair is extremely dry and/or brittle you are going to love this next item. Item four is the Intense Moisturizing Treatment. This treatment deep conditions the hair very well because it is highly concentrated and contains a mixture of argan, avocado, olive, and coconut oils which are all known to actually penetrate the hair. Since these oils penetrate the hair strand instead of just sitting on top and coating it, the hair is being conditioned from the inside which gives much longer results. I of course also added some liquid silk in this as well to make even the most dry hair feel amazingly silky and soft to the touch. If you experience having dry hair, you will definitely love this product! If your hair is not extremely dry, you can still benefit from it by using as a preventative tool instead. For example you can use the shampoo before a chemical service, and again on the service after the chemical to help prevent your hair from drying out. To use this product, apply a liberal amount to the entire head, from root to tip on towel dried hair. Cover hair with plastic bag and let sit for at least thirty minutes (the longer the better). No heat is required, but it is optional. Rinse with cool water. 5. This next item is one of my favorite in the entire line. It is the Leave-In Conditioner. This leave in conditioner does three things for the hair. It adds an extra layer of moisture to the hair, acts as a heat protectant, and also helps detangle the hair. And more importantly, it is very lightweight so you literally can not use too much. It will not weigh your hair down at all. I use this generously when applying to my own hair and my hair still has plenty of body when I actually style it. Always use the leave-in conditioner after rinsing out other conditioner. 6. After applying the leave-in conditioner you will then begin to style your hair as usual. Once you get done styling you will use by L. Jones finishing products to really take your hair over the top. The Miracle Potion no.9 which is the most popular item in the line is a lightweight spray that adds shine, helps control frizz, and makes the hair smell deliciously wonderful! Only 2-3 sprays is enough for your entire head. That is all! I have had clients tell me that after using the Miracle Potion no.9 that even a week later their husbands are still complimenting them on how good their hair smells. 7. The last item is the Silky Serum Oil. This item is basically a thicker, oil version of the Miracle Potion no.9. When doing silk presses this is my secret weapon because I use this while blowing the hair dry. 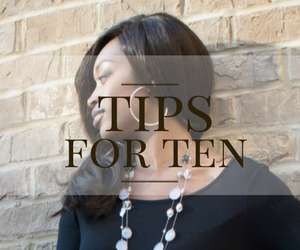 I only use a tiny dime size amount even for extremely long and thick hair because as I am brushing the hair while using my blow dryer, it is being evenly distributed throughout the head. After that, once my flat iron hits it, there is an immediate shine. This will also eliminate any flyaway hairs that may try to make an entrance. Be careful with this, a little goes a long way! One to two pumps is plenty for the hair. 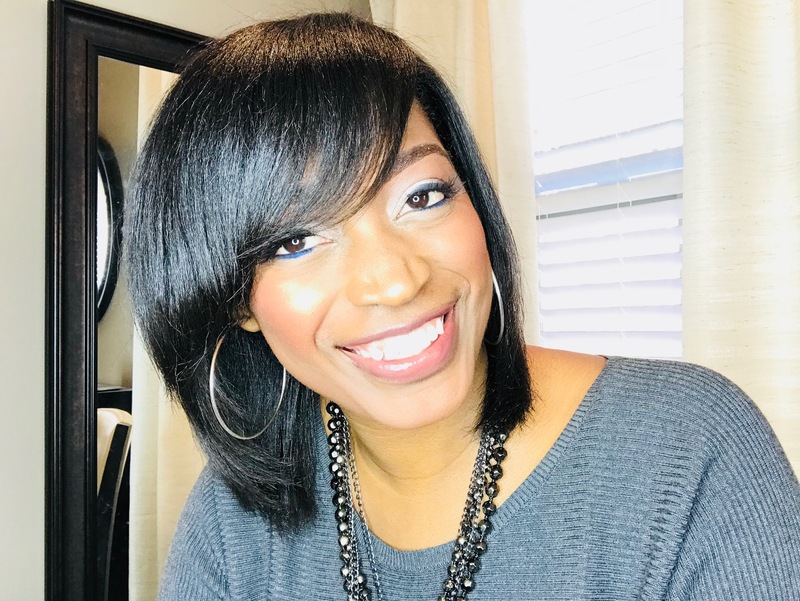 **Bonus** After blow drying your hair, use the Toi flat iron (see why this is the best flat iron for a silk press right here). It gets the hair straight with one pass! 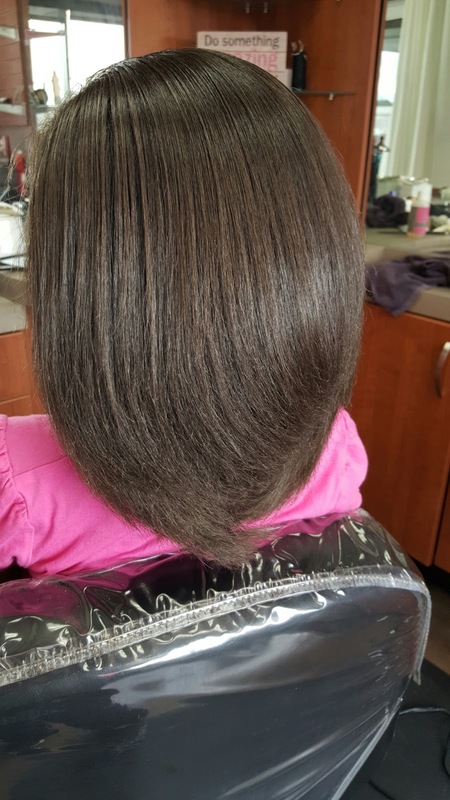 If you use my top 7 best products (by L. Jones), you will definitely achieve amazing silk press results on natural hair. I use these products daily in my salon and all of my clients. Use these products on your next silk press and then come and let me know what you think! 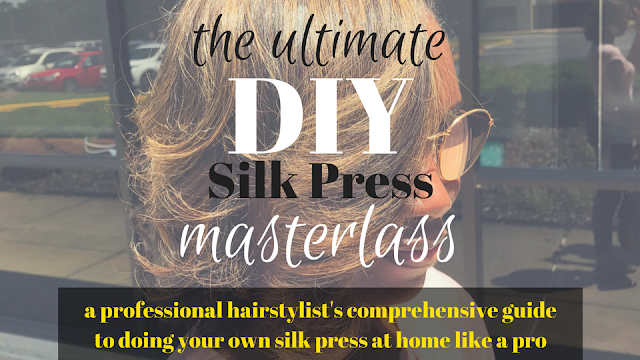 If you have no idea what you are doing and would be interested in taking my DIY Silk Press Masterclass, click here for more information. 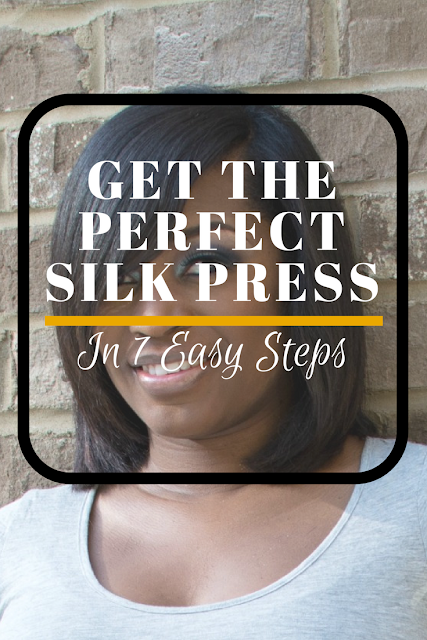 Want the FREE downloadable pdf guide for getting the perfect silk press in 7 easy steps? Click here to have it sent straight to your inbox! 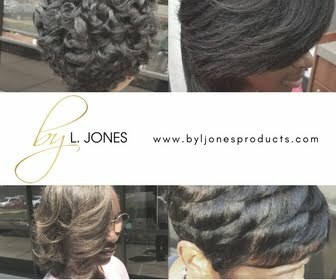 Place your orders at www.byljonesproducts.com! My name is Brenda and I am struggling with my 4c natural hair. I am unable to comb it even it is flat ironed. I have to finger comb it all the time. It's not very easy to manage and the hairs on my head stick together even if it is flat ironed. I have to gently pull the strains apart everyone morning because the hairs tend to wrap themselves around each other. A regular comb will only break and pull my hair out, just like the straighten comb was doing. I started to get a perm just to make things easier but I don't want the chemical. I need some serious help. I've tried everything except for your products. I check out your website and I like it but not sure it will help my hair. It sounds like it may be time for you to get a trim as well. When your split ends continue to go up the shaft this can happen. I would suggest that you get a professional trim (if its been quite a while, be prepared for a cut) then use the products. I recommend the Extreme Moisture shampoo, the Leave-In conditioner, and the Replenishing Conditioner to help with detangling and to make the process of combing and detangling much easier for you. What is a good flatiron to use? Thx! 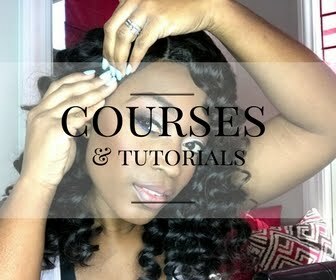 Does your flat iron have to have an adjustable heat setting? Opening a salon , how can I purchase and Introduce this product to my clients? Around how much are these products together ? Where can I buy this product? How much are these products?